CORPORATE HEADQUARTERS AND CASSOPOLIS SOLUTIONS CENTER 60590 Decatur Road Cassopolis, MI 49031 M–F 8 a.m.–5 p.m. PAW PAW SOLUTIONS CENTER 59825 S. LaGrave Paw Paw, MI 49079 M–F 8 a.m.–5 p.m. ADRIAN SOLUTIONS CENTER 1610 E. Maumee Street Adrian, MI 49221 M–F 8 a.m.–5 p.m.
Join us on Facebook: facebook.com/teammidwest Midwest Energy & Communications is an equal opportunity provider and employer. just want to take a minute to brag a little. It’s my column, so I reserve the right to use it any way I want. It’s not unusual for our team to step up and provide you with the best possible service experiences; that’s just a quality that is part of our collective DNA. However, for one solid month in early 2019, we were put through the wringer. Many of our customers offered heartfelt thanks and encouragement during these tough situations, and those comments kept us going. I just want to add my personal and sincere thanks as well. I’m beyond honored to work with such an amazing and committed team. represented by Fred Turk of Decatur, includes Hamilton, Decatur, Porter, Volina, Marcellus and Penn Townships. District 2, represented by Jim Dickerson of Bloomingdale, includes Silver Creek, Pipestone, Bainbridge, Keeler, Coloma, Watervliet, Hartford, Lawrence, Paw Paw, Waverly, Arlington, Bangor, Covert and Bloomingdale Townships. District 5, represented by John Green of Dowagiac, includes Milton, Howard, Pokagon, LaGrange and Wayne Townships. For more information about serving on the board of directors, please call us at 800-492-5989. 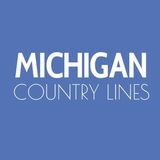 We will share election information in the November/December issue of Michigan Country Lines. Upcoming Office Closures Our solutions centers will be closed on Friday, April 19, and on Wednesday, April 24. Make a payment or report an electric outage via SmartHub. Call 800.492.5989 to make a payment or request an emergency propane fill. Drop box payments made at our three solutions centers will be processed on the next open business day. ach year, the National Rural Electric Cooperative Association’s (NRECA) President’s Award recognizes an individual who has made an outstanding contribution to improving life in rural America; this year, our very own president and CEO, Bob Hance took home the honor. Beyond serving as a tireless proponent for eliminating the digital divide and bringing fiber internet to rural Michigan, Hance has helped secure more than $4 million in economic development funds and is a known voice among federal, regional and state policy makers. He also launched a proactive line clearance program to improve electric reliability, helped to develop one of the best workplace cultures in the area, and pushed MEC to become a valued resource for customers adapting to modern, high-tech life. “Bob has been a change agent,” said NRECA Board President Phil Carson. “Through his advocacy efforts and sheer willpower, he has helped bring rural broadband and the needs of rural communities to the fore.” “’Vibrant, relevant, sustainable rural communities.’ These aren’t just words on a wall somewhere. It’s a vision I live and breathe each and every day and it’s what motivates me to keep doing more—more for our customers and more for the communities we serve” said Hance. Jim Matheson (left), CEO of the National Rural Electric Cooperative Association (NRECA), and Phil Carson (right), NRECA board president, present the President’s Award to Bob Hance (center). ooking for an easy way to start saving energy today? Request your FREE energy-saving kit from the Home Energy Express Program! This offer is available at no cost to you through your electric cooperative’s Energy Optimization program. What’s in the kit? The free kit contains products that will help you start saving energy immediately. The devices will help you control the amount of energy used to heat and cool your home, as well as the electricity used by lighting, appliances, and electronics. There may even be some water-saving items in your kit, which can help reduce the overall amount of water you use and the energy consumed for hot water heating. ONLINE: michigan-energy.org PHONE: 877-296-4319 Energy Optimization programs and incentives are applicable to Michigan electric service locations only. Other restrictions may apply. For a complete list of participating utilities, visit michigan-energy.org. Get Started Today Before requesting your free kit, please review the following eligibility requirements. You must: •	Be a member of Midwest Energy & Communications. •	Own a single-family home or, if you are a tenant, must have the owner’s permission to have work done on the home. •	Be willing to sign a document to allow work to be done on the home by professional, trained contractors. Energy Optimization programs and incentives are applicable to Michigan electric service locations only. Other restrictions may apply. For a complete list of participating utilities, visit michigan-energy.org. MEET RYLIE Meet Rylie, a solutions agent. She helps our customers when they call in with questions, and she also works in our dispatch center sending our line crews, propane service techs, and internet field support to help customers throughout our service territory. Rylie grew up on our lines and even remembers us as Fruitbelt, and she continues as a current MEC customer for electric, internet and propane. A native of Decatur, she currently lives just outside of the town with her husband, stepson, five dogs, three cats, and cows. Rylie came to MEC four years ago after dispatching trucks nationwide for a flower company. “I love helping people, and that’s why I enjoy working in dispatch. I know the work I do makes a difference, and every day is different,” said Rylie. As a family, they believe in the value of knowing where their food comes from. “We don’t buy boxed food. We raise our animals for meat and grow our own produce. It’s hard work, but it’s worth it,” said Rylie. That dedication also comes through in the elaborate cakes that she makes for family and friends. “I bake everything from scratch and really enjoy making new creations. I also love knowing that I can brighten people’s days with my hobby.” Her kindness extends to animals as well. In fact, all of her pets are rescues. She mentioned that “it’s hard to say ‘no’ to an animal in need. We take them in whenever we can because they deserve good lives in a caring home.” That passion for helping others is why we are proud to have Rylie as part of the MEC family. We know what a difference it makes. Rylie earned her bachelor’s degree in criminal justice and human services, through which she focused on learning how to become a 911 dispatcher. Those skills serve her well at MEC, especially during major outage situations, where she utilizes her calm demeanor and attention to detail to ensure our crews have the information they need to make repairs safely and efficiently. When not at work, she and her husband enjoy fishing, particularly catfishing, and they also hunt when they can. They have fun supporting their son’s passion for science. “Our kitchen doubles as a science lab, and it’s so much fun to watch him learn through performing experiments,” she noted. Almost too cute to eat! Rylie made this cow cake for a friend. n February 22, high school students from Britton Deerfield School District, Morenci Area Schools and Riverside Academy headed to Adrian College for a lesson in real-life financial management at the “It’s Reality” personal financial management fair held by TLC Community Credit Union, Adrian College and us. Welcome To Reality MEC employees Sherri Dotson, Eric Keller and Patty Nowlin help students learn about personal finances. The students picked a hypothetical career and established the average monthly starting salary. Students were then provided with a budget sheet that included monthly income, an amount in a credit union account and a credit score. They had to manage their finances by making purchases and staying within budget. The goal of the fair was to give kids a dose of reality and make them understand the value of making wise financial decisions. Several staff members from MEC attended the event and helped students make financial decisions on furniture, food, transportation, technology and more. id you know that many of your household electronics continue to use electricity even when they aren’t on? Additionally, device chargers that are left plugged in after the device has been removed from the charger also continue to utilize electricity. This means that your household is still using electricity even if you aren’t. According to the U.S. Department of Energy’s National Renewable Energy Laboratory, this wasted energy adds up to roughly $200/year in electricity costs. Here are some tips to reduce the drain: •	Unplug devices and chargers when they aren’t in use. •	Put your computer into sleep mode when unplugging it isn’t practical. •	For devices that aren’t easy to unplug, consider using an advanced power strip that can automatically shut off the power for you. Here are some of the types available: Timer power strips shut off the power at a set time º	 every day. for signs of activity in the room. If no activity is detected, it shuts off the power. While convenient, this type isn’t always reliable—especially if Fido roams around the room. the entire strip when the item designated as the “master” gets turned off. These power strips also often have an “always on” outlet in case you want to plug something in, such as a wireless router, that should always have power even if other devices plugged into the strip are turned off. Masterless power strips cut the power when all the º	 devices connected to it are turned off. Remote switch strips allow you to turn off the º	 power via a remote. However, you have to remember to shut it off. •	When replacing or adding new electronics to your home, select ones that have are energy efficient to reduce the amount of power consumed while in standby mode. Michigan Residents Purchase an advanced power strip at one of our solutions centers for as little as $10 and save money and energy. We also have LED nightlights and lightbulbs to help you save even more. hen an unanticipated problem occurs with your home’s electrical, water heater or HVAC systems, it can be expensive, and damage to these systems from normal wear and tear is typically not covered by basic homeowners insurance. So we are partnering with HomeServe to offer you optional coverage to help protect your pocketbook against emergency repairs. These affordable plans provide emergency repair service through HomeServe’s 24/7 hotline. Work is performed by local, licensed and insured technicians with no deductible or call-out fees (up to the benefit limit). There is a one-year guarantee on all covered repairs. Don’t get caught off-guard by emergency repairs. Sign up now and get peace of mind knowing that a plan from HomeServe can help protect your finances. Please watch your mail for additional information coming soon. *Plans cover repairs, up to the benefit amount, for damage from normal wear and tear, not accident or negligence to covered items. Plans subject to eligibility requirements, exclusions and coverage limitations. See upcoming letter for more information. HomeServe USA Repair Management Corp. (“HomeServe”), with corporate offices located at 601 Merritt 7, 6th Floor, Norwalk, CT 06851, is an independent company separate from Midwest Energy and offers this optional service plan as an authorized representative of the service contract provider, North American Warranty, Inc., 175 West Jackson Blvd., Chicago, IL 60604. Your choice of whether to participate in this service plan will not affect the price, availability or terms of service from Midwest Energy & Communications. Notice to Electric Customers of Midwest Energy & Communications Special Board Meeting: April 23, 2019 The Midwest Energy & Communications (MEC) Board of Directors will consider changes to the cooperative’s rates and tariffs in accordance with P.A. 167 of 2008, at its meeting on April 23, 2019, beginning at 10 a.m. The meeting will be held at the headquarters office, 60590 Decatur Road, Cassopolis, Mich., and is open to any MEC electric customer. Customers will have an opportunity to address the board on the proposed changes prior to board action. The following item will be considered: •	Increase Distribution Charge across all rate classifications Notice of changes or additions to the cooperative’s electric rates or service rules shall be sent to all customers as required by P.A. 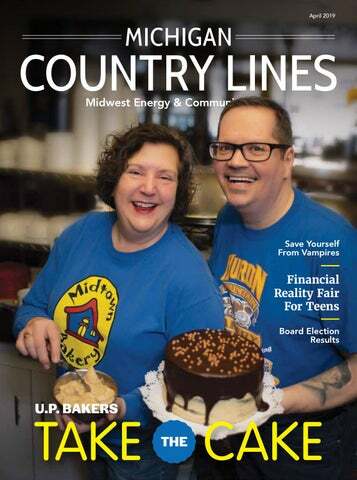 167, by publication in Michigan Country Lines at least 30 days prior to their effective date. Participation: Any interested electric customer may attend and participate. The location of the board meeting site is accessible, including handicapped parking. Persons needing any accommodation to participate should contact Paige Deak at 800-492-5989, ext. 1049, a week in advance to request mobility, visual, hearing or other assistance. Comments may also be made through Ms. Deak, or by email at team.midwest@teammidwest.com. Notice to Electric Customers of Midwest Energy & Communications 2019 Annual Meeting The Annual Meeting of the Midwest Energy & Communications (MEC) electric customers is April 23, 2019. The Annual Meeting will immediately follow a Special Board Meeting, which begins at 10 a.m. The Annual Meeting is called by the Secretary of the Cooperative pursuant to Article II of the MEC Bylaws. The purpose of the annual meeting is to announce the results of the ballots cast and the election of the MEC Board of Directors in Districts 6, 7 and 9, and to act on any other business properly brought before the board. This annual meeting will be held at the MEC headquarters office, 60590 Decatur Road, Cassopolis, Mich., and is open to any MEC electric customer. Get a $150 per panel rebate on up to 20 panels when you subscribe to our SpartanSolar-MEC community solar array. Sign up by Nov. 30 at spartansolar.com. Get a $30 Netflix gift card when you sign up for our Advanced, Ultra or Gig package. All of our packages include: unlimited data, 24/7 tech support, symmetrical speeds, free installation. Sign up by June 30, 2019. Enter promo code: STREAM. teammidwest.com/internet | 800.492.5989 Twelve-month contract required. OďŹ&#x20AC;er valid until 6.30.19 to new subscribers only. Gift card will be emailed following installation. Free installation available to Midwest Energy & Communications electric customers only. Internet services are not regulated by the Michigan Public Service Commission.